We Lead the Industry in Commercial Grade Cleaning Machines! We are an international organization that designs, develops and manufactures innovative cleaning products to liberate the cleaning world at work! 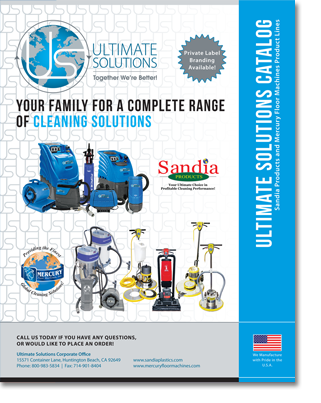 Ultimate Solutions includes our family of brands: Sandia Products and Mercury Floor Machines. One of our core values is to "stop spreading dirt and start spreading joy"! Our revolutionary ideas will change the way you think about cleaning. We really care about the cleaning business because we really care about people. Using our knowledge and expertise, we want to change perspectives by making life easier and more fun for those who clean the world.